Officers who had “a history of lying, racial bias, or brutality” were quietly prevented from testifying. The Philadelphia District Attorney's office kept a list of police officers "with a history of lying, racial bias, or brutality" to keep them from testifying in court, The Philadelphia Inquirer reports. 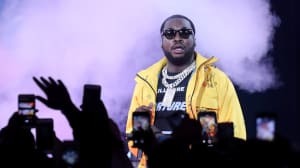 The list reportedly contained over two dozen police officers, including Reginald V. Graham, the cop responsible for the 2007 arrest of Meek Mill (real name Robert Rihmeek Williams). Graham's arrest of Williams led to charges of illegal possession of a firearm and assaulting a police officer. Williams has been on probation since, and was recently imprisioned for two to four years on probation violations. Graham retired in 2017 after 22 years and over 400 arrests — his name was reportedly put on the list four months after he left the force. Prosecutors have reportedly admitted that Williams's lawyers in 2007 were never made aware of the list's existence. However, they may not have been the only ones kept in the dark: The Inquirer reports that attorneys for "hundreds of past defendants" were not informed that their clients were arrested by possibly compromised officers. The list was allegedly created in January 2017 at the command of former D.A. Seth Williams, and mirrors a similar list used by the D.A. 's office in Seattle in 2007. Prosecutors in Philly hoped to combat "testilying." That is, police "falsifying evidence, framing suspects, and lying about it in court." Williams appointed six prosecutors to a "misconduct committee" to address testimony from officers who were found guilty by the Police Board of Inquiry of certain offenses, such as lying and abuse of power. Officers with repeat infractions were flagged and placed on the list, and prosecutors seeking their testimony in court were reportedly required to obtain permission from "top officials of the District Attorneys Office." Current Philly D.A. Larry Krasner confirmed the list's existence last week, and called its implementation “apparently ineffectual at best.” He reportedly plans to unveil "a comprehensive plan for addressing problem officers and their testimony" within three months. Sources to The Inquirer claim that the police misconduct committee is discussing how to notify defendants whose cases relied on the testimony of listed officers. The names on the list have not been revealed to the public – according to The Inquirer's sources, prosecutors are concerned with the privacy of the named officers, as well as the implications it could have for convictions made from their arrests. A spokesman for police union Fraternal Order of Police Lodge 5 claims the branch had no knowledge of the list. According to court records, Williams's 2007 conviction was based on the testimony of Graham, one of several arresting officers. Graham claimed that he witnessed Williams selling drugs and, when police made the move to arrest, pointed a gun at officers. Williams admitted he had a gun but denied selling drugs or threatening police. Williams was convicted of drug possession, firearms violations. and simple assault, and served five months in jail. Jeffrey Walker, Graham's former partner, testified against Graham in an explosive 2015 federal corruption trial against six Philly narcotics officers. “I would steal with Reggie Graham,” Walker admitted. Graham was not charged with any crimes, and all six officers were acquitted. However, the federal trial led the city to drop 800 cases and freed many defendants, and paved the way for dozens of successful civil suits against the city of Philadelphia.